If you have been denied the fair pay you deserve or are involved in an overtime dispute with your employer, please call Lewis Kuhn Swan PC today at 719-694-3000 to speak with an experienced attorney. We help clients from Colorado Springs, Pueblo, Castle Rock, and throughout the state. Unpaid overtime? Our attorneys can help. The Fair Labor Standards Act (“FLSA”) affects more than 130 million American workers, including both full-time and part-time workers in the public and private sectors. Although there are exceptions for certain types of workers in particular fields, the FLSA generally requires employers to pay non-exempt employees at least one and one-half times their regular rate of pay for all hours worked in excess of forty (40) hours in a fixed seven (7) day workweek. For example, if an employee’s regular rate of pay is $30/hour, she must be paid at least $45/hour for each hour she works in excess of 40 hours in a particular workweek. 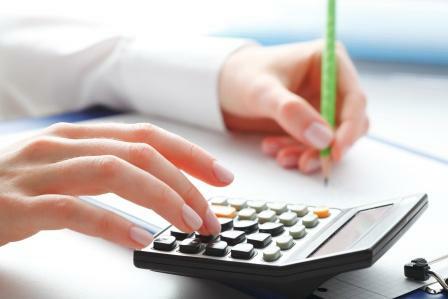 An employee’s regular rate of pay includes certain bonuses to which he or she is entitled. In some circumstances, an employee is hired at a fixed weekly salary for more than 40 hours in a workweek. This employee may still be entitled to overtime compensation depending on job duties. The fact the employee is paid a salary instead of an hourly wage does not automatically disqualify him or her from entitlement to overtime compensation. For example, a non-exempt employee may be paid an annual salary of $50,000 (which works out to about $25/hour) and receive a production bonus of $10,000 per year. This employee should be paid at $45/hour for all hours worked in excess of 40 hours per week based on this math: $50,000 salary + $10,000 production bonus = $60,000 (or about $30/hour). One and one-half x $30/hour = $45/hour. Federal and state law requires employers to pay non-exempt employees overtime wages for all hours worked over 40 per week. Many employers, however, skirt their obligations under these wage and hour laws by misclassifying their employees as exempt. This illegally enables employers to avoid paying overtime compensation. Misclassification issues often arise when an employer pays its employees a fixed salary or commission regardless of the number of hours its employees work. A question we are often asked is whether payment of a salary automatically bars an employee from receiving overtime wages. The answer is an unequivocal “no.” Depending on their job duties, many salaried and/or commission-based employees are entitled to overtime compensation for all hours worked in excess of 40 per week. Misclassification occurs in a number of different jobs, including loan officers, underwriters, and assistant managers. If you believe you have been misclassified as an exempt employee, contact us today for a free, no-obligation case evaluation. You may be able to recover unpaid overtime, an equal amount of “liquidated damages,” attorneys’ fees, and court costs. The FLSA overtime requirement cannot be “waived” by contract or agreement between an employer and an employee. What matters is what the employer does, not what the employer says — if the employer makes or permits you to work overtime, you are entitled to overtime pay, even if the employer says overtime is not allowed. The FLSA ordinarily has a 2-year statute of limitations (if an employer’s violation was willful, a 3-year statute of limitations applies), so it’s important to act quickly if you may have a case. In successful actions under the FLSA, employees are often entitled to back pay, an amount equal to that as “liquidated damages,” attorneys’ fees, and court costs. Is your job title “Analyst” or Auditor” or something similar? If so, you may be entitled to overtime pay. Many employers improperly classify employees in these positions as “exempt” from overtime requirements, meaning the employees do not receive overtime compensation for hours worked over 40 hours in a week. Instead, many employers pay their Analysts or Auditors a fixed salary, sometimes without bonus potential. However, employees in these positions often should be entitled to overtime pay. If you are an Analyst, Auditor, or hold a similar position and are not receiving overtime pay, contact us today for a free, no-obligation case evaluation. Is your job title “Assistant Manager,” “Shift Supervisor,” “Assistant Vice-President,” or something similar, yet you spend almost no time managing people? If so, you may be entitled to overtime pay. Many employers use these job titles and pay these employees a fixed salary, leading them to believe they are not eligible to receive overtime pay. However, employees in these positions who do not regularly supervise two or more full-time employees, do not exercise much discretion, or do not make managerial decisions may be eligible for overtime pay. If you an assistant manager or similar position and are not receiving overtime pay, contact us today for a free, no-obligation case evaluation. Is your job title “Loan Officer,” “Loan Originator,” “Loan Processor,” or something similar? If so, you may be entitled to overtime pay. Banks and mortgage companies often misclassify their loan officers and processors, mortgage originators, and other like jobs as “exempt” from overtime requirements, meaning the employees do not receive overtime compensation for hours worked in excess of 40 hours per week. Many employers pay employees in these positions a fixed salary, draw plus commissions, or on a commission-only basis. However, the law says that employees in these positions often are entitled to overtime pay when their primary job duty is selling loans from inside an office. This is true whether or not your employer pays you a “fixed” salary. Many banks and mortgage companies are starting to reclassify their loan officers and processors, mortgage originators, and other like jobs, paying them minimum and overtime wages. You may still have a claim for these wages, even if your employer has reclassified you. If you are a loan officer, mortgage originator, or other similar employee and are not receiving overtime pay, contact us today for a free, no-obligation case evaluation. Banks, mortgage companies, and other financial and insurance companies routinely misclassify their underwriters as exempt from minimum and overtime wages. Oftentimes, underwriters do not exercise much discretion and/or make managerial decisions in performing their job duties, and thus are entitled to overtime compensation for hours worked in excess of 40 per week. This is true even if the underwriter is paid on a fixed salary, draw plus commission, or commission-only basis. For example, J.P Morgan Chase & Co. recently settled a case for $42 million brought by its underwriters who were tasked with approving loans. See Davis v. J.P. Morgan Case & Co., 08-4092-cv (W.D.N.Y. 2008). If you are an underwriter or similar employee and are not receiving overtime pay, contact us today for a free, no-obligation case evaluation. 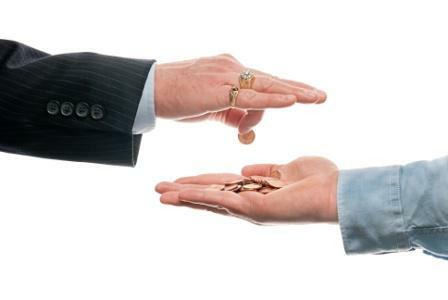 Companies frequently incentivize their employees by promising bonuses and/or commissions. When employees work hard to make their bonuses and commissions, the companies benefit. Unfortunately, employers often fail to live up to their promises to pay what their employees deserve. Sometimes they simply refuse to pay these bonuses and commissions. Sometimes they change the eligibility rules mid-game or even after the fact. Sometimes they miscalculate these bonuses and commissions (coincidentally, these miscalculations are rarely in favor of the employees). When you’ve been promised extra compensation in exchange for your hard work or performance, your employer has an obligation to provide it. If they don’t, contact us for a free, no-obligation case evaluation. Nearly all American workers must be paid at least the minimum wage for all hours worked. The federal minimum wage is currently $7.25 per hour. This is equal to $290 per week for a 40-hour work week, and $253.75 for a 35-hour workweek. Of course, a worker’s paycheck will be less than this because of federal and state tax deductions, other mandatory deductions, or deductions to which the worker has agreed, such as health insurance payments and the like. Nonexempt workers who work more than 40 hours in a workweek are usually entitled to be paid at one-and-one-half times their normal rate of pay. For a minimum wage worker, this equals an hourly rate of about $10.88. Many states have their own minimum wage laws. In many cases, the state minimum wage is higher than the federal minimum wage. Colorado, for example, has a minimum wage of $10.20 per hour as of 2018. (The Colorado minimum wage is adjusted annually for factors such as inflation.) The Colorado minimum wage, however, only affects certain types of workers, including workers in retail and service, commercial support service, food and beverage, and health and medical industries. 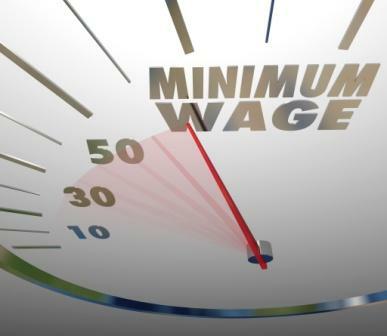 If a state has a higher minimum wage than the federal minimum wage, state law controls. Elsewhere on this website we discuss ways employers try to reduce payments to employees by using creative accounting methods. But no matter how creative an employer is, the law says that workers must be paid at least the minimum wage. The Fair Labor Standards Act (FLSA) allows employers to round employee time to the nearest quarter hour. Hence, if a worker clocks out at 5:35 pm, the employer may round the worker’s time to 5:30. However, to be legal, the employer must also round up when the worker clocks out 8 or more minutes after quitting time. Hence, if the worker clocks out at 5:38, the employer must round the worker’s time up to 5:45. Sometimes employers automatically round workers down to eight hours in a day, or 40 hours in a week, irrespective of how many hours the worker actually clocked. This is illegal if the time actually worked is more than eight hours in the day or 40 hours in the week. Together with our national associates, we have collected millions of dollars of unpaid compensation owed to hardworking employees. While every case is different and past performance is no guarantee of future success, we have the experience and the tools to go up against large corporations and help you get what you deserve. The lawyers and legal professionals at our office are committed to listening to the facts of your particular situation; giving our objective perspective about whether you have a case; providing guidance about alternative ways forward; sharing potential risks and complications; and maintaining the highest levels of ethics and confidentiality. When you contact our office, you can be confident that we will listen to the circumstances of your matter without judgment. We seek to be a resource for employees who may have been wronged by their employers. Big corporations have resources to try to deny you what you’ve earned. We fight every day to balance the scale. Different claims have different statutes of limitations, and the clock may be ticking on recovering what you deserve. Contact our office today for a free, no-obligation case evaluation. You deserve to be paid fairly for the work you perform. If your employer has failed to pay you the overtime you deserve, please call Lewis Kuhn Swan PC today at 719-694-3000 to discuss your case. We welcome workers from Colorado Springs, Pueblo, and Castle Rock.